Have you ever had a really special cooking class? It was a Sunday, a week or two ago, and six of us were chopping garlic in Martha Rose Shulman’s home kitchen, while she shared new ideas for leafy greens and her co-instructor, Clifford Wright, Mediterranean food historian and cookbook author, offered insider tips such as the wright way to use a mortar and pestle for extracting maximum flavor. There are people who marvel over a stunning sunset, others are exhilarated by a nail-biting football game (talking to you dad), but I am so very happy to be among food heroes and knife wielders, discussing seasoning options for a butternut squash soup, while stripping chard leaves away from the stems. Crazy? 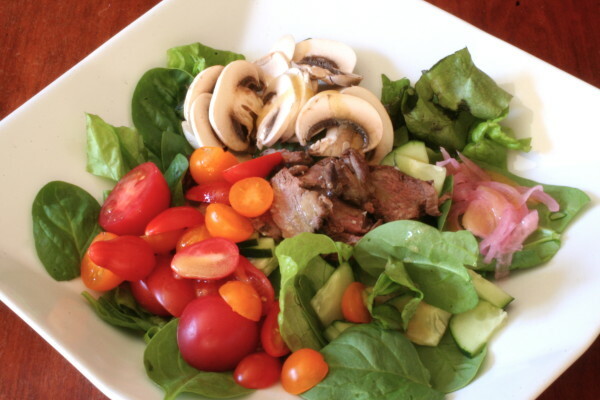 Martha Rose Shulman is the esteemed writer for the New York TimesRecipes For Health column and author of several best sellingcookbooks. Clifford Wright earned the James Beard Award for Best Food Writing in 2000 for his book, A Mediterranean Feast, he also writes for many top name food magazines. 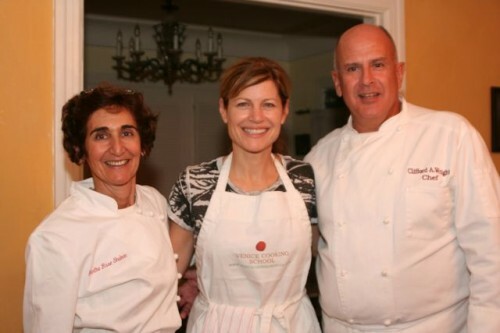 Together, they launched the Venice Cooking School, in Southern California. Yes, our very own NYT treasure, lives in California. Lucky us. If you’re close by, I highly recommend you check out their roster of upcoming classes. Because both Martha and Cliff are food writers and longtime recipe developers, they share practical information while also giving rich backstory to techniques, practices, seasonings, and more. Their lessons are lasting and applicable to all cooking. 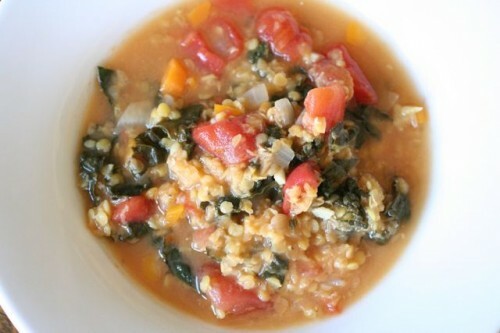 For everyone else, we have one of Martha’s recipes- lentil and kale minestrone – right here at crunchtime. 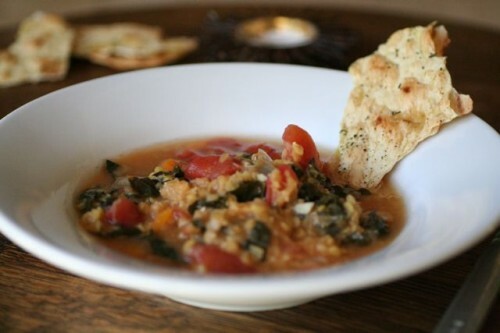 Usually, we all have to work hard to get the healthiest vegetables into our diet, but her hearty minestrone makes lentils and kale taste so amazing that you really have no excuse for not whipping this up for the whole family. The flavors are intense because Martha showed us how to build seasonings and it freezes like a charm for a quick crunchtime thaw and eat. 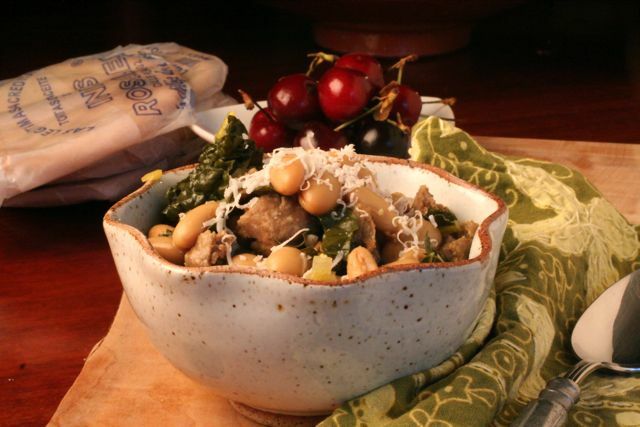 Did you know that minestrone translates to “big soup” in Italian? Don’t go saying minestrone soup unless you mean big soup soup. 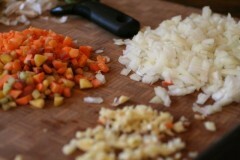 It all starts with very basic ingredients, remember mirepoix (sauteed chopped veggies that comprise the flavor base). Garlic gives the big soup soup zing as does salting along the way. 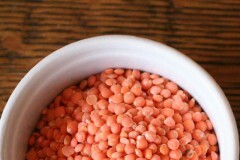 Red lentils, that are orange, make the soup, not red or orange, but bright light yellow – giving you the full range of sunset colors, an especially welcome feature among the drab look of winter foods. Martha also used a bouquet garni with parsley, thyme, bay leaves, parmesan cheese rinds and a red pepper pod. Here’s a tip, save all of your salty, flavorful cheese rinds to lend flavor to soups and stews. Even if you’re not bundling a bouquet garni, slip in a rind or two, and then fish them out before serving. 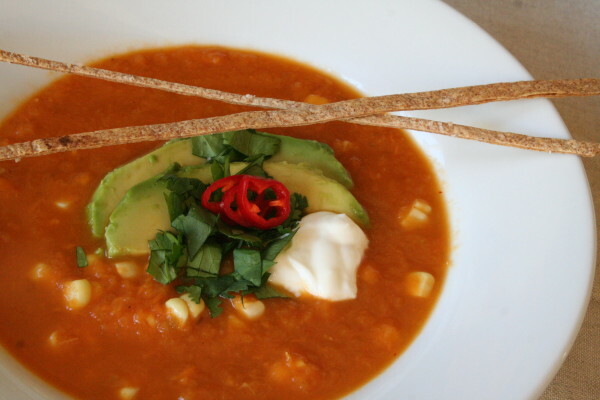 The soup is easy to make, without much tending, but you’ll want to allow yourself about 90 minutes from beginning to end. Like most soups, this one is even better the next day, so the do-aheads make this soup very possible for a weeknight meal. Head the oil over medium-low heat in a heavy soup pot. 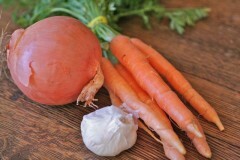 Add onion and carrots. Cook, stirring for 5 minutes. Stir in a generous pinch of salt and the garlic. Cook for 1 minutes. Add in tomatoes, thyme and oregano. Turn the heat to medium and bring tomatoes to simmer. Cook 10 minutes. Stir in lentils and water and stock and bring to a boil. Add the bouquet garni, red pepper flakes, reduce heat and simmer 30 minutes. 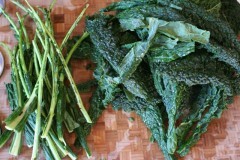 Add 2 teaspoons salt (taste to your liking) and the kale. Simmer another 15 minutes. Add in pasta here and cook another 10-15 minutes. Note: if you want to eat some of the minestrone at a later date, then add in the pasta only into the portion you will serve. Otherwise, the pasta will continue to cook through the reheats and get mushy. Grind in some pepper and taste. Remove the bouquet garni. Stir in the parsley.